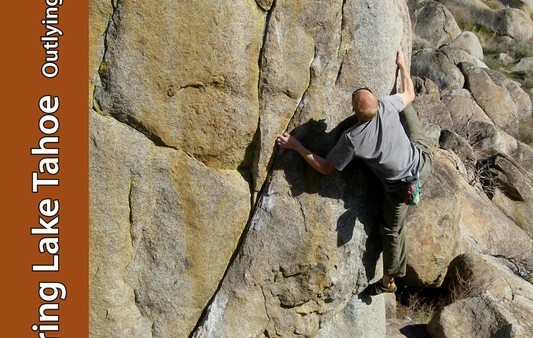 Bouldering Lake Tahoe-Outlying Areas Edition features over 2,500 problems at 20 different areas.This is a comprehensive guide covering every pebble that has been wrestled on the outskirts of Tahoe. Some of the areas included are: Doyle, Purgatory, Pyramid Lake, The Sierra Buttes, White Rock Lake, Hwy 20, The Bathtubs, Prison Hill, Washoe Boulders, Erratica, Sivler Lake, Ronin, Woodfords Canyon, Loon Lake and much more. It has full color photos of all the boulders, topos, overview maps, breathtaking photography and everything else you need to get you to the boulders.This book is written by local climbing pioneer Dave Hatchett, so you can be assured the info will be accurate and up date. I’m looking forward it. I’m a big fan of your work.